Aidan: Well Mike, this is our first blog post together and I thought maybe we could start with LifeShapes as it seems sort of the language for everything you have done and are doing. Mike: Right. It is pretty, pervasive, isn’t? Obviously St. Toms uses it and churches all across Europe, churches in 3DM Learning Communities almost always use LifeShapes and they really serve as a kind of “Rule of Life” for The Order of Mission. At this point it’s just hard to keep track of how many countries LifeShapes are being used in. Aidan: I seem to remember you have a funny story about someone with a LifeShape on their t-shirt. Aidan: Probably a good thing they went that route. Mike: I should say so! Aidan: Before we dive right in, if you could simply define LifeShapes in 1-2 sentences, how would you define it? Aidan: So yeah…that was quite simple. That’s it? Mike: Well, it’s not too difficult to grasp what we’re trying to do with LifeShapes. We are trying to create a culture of Discipling Leaders (obviously this is what Jesus is going after in the Great Commission, everyone makes disciples) and in order to create culture you need a language to support and create that culture. What LifeShapes does is create a vocabulary which creates a language which in turn creates a culture. That’s just basic sociology. Aidan: I mean, when I first heard that, I’m not gonna lie: That sounds a little too simplistic. I’m not sure I really bought into that being true. Mike: Right, I get that, but I think it’s all very intuitive. I think people who have a strong intuitive sense pick up and run with it really quickly once they’ve seen it once or twice because they’ve seen how true it can be. Maybe an example would help: If you want a really missional culture, you talk on and on about Persons of Peace (the Octagon), you will quickly create a missional culture. Same with the Triangle (UP/IN/OUT). You talk about that long enough and you’ll develop a culture that is balanced and has sustainable, deep relationships. Every church does this. They have words, phrases, a vernacular that they use, and once it gets in the water, it creates a certain culture. You use the language so much that it becomes the way you see and understand the world. What I have tried to do with LifeShapes is create a vocabulary that creates the culture we think Jesus wants: A Discipling Culture. Aidan: Well why don’t we start at the beginning…seems like a good place to start! 😉 How did you hop onto this process? Where did it begin? Mike: Well I was in a Pastoral Theology lecture and the professor was teaching something akin to the Circle, but was less complete and I thought to myself, “Wow, that’s really interesting.” I spent a lot of time ruminating on it, reading quite a bit of scripture, asking if I thought it was Biblical and after some time it really seemed to center around Mark 1:14-15 for me. The whole process for developing what the Circle is now probably took 3-4 years. Aidan: When did that process begin? Mike: Probably around the early 1980’s. Aidan: Hmmm…not that that dates you or anything. 😉 So what were the next couple of shapes? Mike: The second one was pretty easy with the Triangle, which I’ve always thought of as the unified field theory…that’s what Einstein was working on right before he died. And for me, that’s what the Triangle is. If there’s one shape, it’s the Triangle because it points back to Jesus. 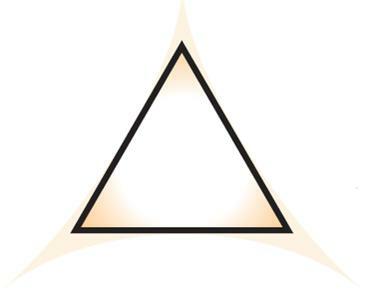 For me, without sounding too dodgy, the Triangle has always had a bit of a mystical quality to it because it so clearly brings us to Jesus who then brings us to the Trinity. About that same time I was reading a book on Discipleship by David Watson and was really processing how we could make Disciples and I ran into a friend at a pub and he drew me this square on the back of a beer mat that he had learned from IBM on leadership and as he is describing it I’m furiously writing notes on the back of these beer mats and when we leave the pub I take them with me (I think I might still have them!). This was somewhere in 1984-1985. I spent more time than you can imagine, reflecting, reading scripture, praying, messing around with the Square, asking, “Is this a Biblical model?” Eventually, the Square that we use today is what came out of it. Years later I realized it was Ken Blanchard’s model and we found out he had come to Christ and had begun to teach it himself as a model for leadership. Pretty cool stuff! And, you know, it was a bit of time before the others came, but the Pentagon and Semi-Circle were next. Mike: HA! LifeShape cannon. That’s funny. Well, what I was going for was rooted out of what Tillich talks about…about looking for signs and symbols. A sign points to a reality greater than itself and a symbol participates in the reality of that sign. Communion/Eucharist is a great example of sign and symbol…it both points to something and participates in what it is pointing to. 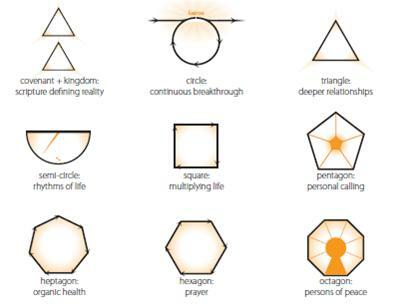 Now I’m not saying all of the LifeShapes are symbols in the way Tillich describes them, but as I mentioned earlier, for me, the Triangle probably is both a sign and a symbol, which is why it’s been that mystical thing for me. But at the very least a LifeShape has to point to a greater reality than itself, particularly ones that we see in scripture or the life of Jesus. Aidan: What are some of the questions you might have asked when evaluating a LifeShape? Is this a Biblical model? Is it an icon that connects you to reality(God)? Aidan: You know, we’ve talked before and I’ve heard you speak about it quite a bit…the power of images or symbols. Can you talk about that a little? Mike: Well obviously we live in an image-based culture and in those kind of cultures, the brain is wired in such a way to store massive amounts of information neurologically through images. All you have to do is look at the three circles that create a Mickey Mouse face. 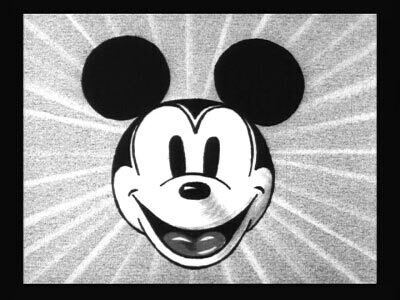 We remember the original illustrator, the company he created, the theme parks, our favorite movies, our favorite songs that we remember every word to, Mickey’s friends…all from seeing three circles! Reading about stuff like that made me realize the stickiness factor of this thing and that once you start sharing it, it’s so easy to remember that other people can share it in the sand, on the back of cocktail napkins, anywhere. Aidan: So here’s my big question: Do you have any more shapes brewing?! Mike Breen: No, actually. Not at all. I think I have a natural bent towards simplicity. I mean, what would be next? The Dodecahedron of Simplicity??! LOL. 🙂 At some point it’s just not simple anymore. And I think Jesus was all about simplicity. Simple but hard–it’s not easy to do. Aidan: I imagine a lot of the people who are reading your blog are people currently using or thinking about using LifeShapes. What we want to do is always have practical insights. As we’ve talked about this, we got to talk a little about why some people may reject LifeShapes or have a difficult time embracing them. What are your thoughts on that? Mike: Some people don’t like it because they think it sounds like jargon. I think lots of churches have read quite a few books and are constantly introducing new things like “Purpose Driven Life” (not that I have any problems with Purpose Driven)…but after a while it seems like you’re constantly selling them something new. This can probably feel like another sales spiel. It could also come across as too simplistic. Some people think that it creates a “Language of Zion” and by creating a specific vocabulary it separates rather than connects. Aidan: So…yeah…I’ve heard pretty much all of those things from a few people in our community or other pastors I’ve talked to about what we’re doing. And quite frankly, I think there is something to feeling like you’re being sold yet another church program that’s going to change your life. I have to admit that I approached it with as much cynicism as anyone. It took me a good year of poking around LifeShapes before I even decided to take it for a test drive. So I get it when people approach it skeptically. How do you combat that? Mike: I think it’s about the Truth. I think LifeShapes are remarkably simple because all they do is capture, in an image, something that is true about scripture or the life of Jesus. What you do is teach the truth from scripture and then at the end just have the shape as a way of remembering it. You don’t have to call it a LifeShape like it’s a formal title. 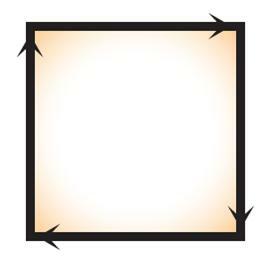 Sometimes if you start with the shape it seems gimmicky or way too simple…when, in fact, if you teach from scripture and capture it in a shape on the back-end, people can see it’s quite a sophisticated, elegant and biblical process to getting to that image. Aidan: I’ve heard you say before not to teach LifeShapes in a sermon series. Why do you feel so strongly about that? Mike: From my personal experience and watching other pastors, I’ve seen that if you do a sermon series with it or teach it all the time, people naturally categorize it as more information to be forgotten. Unfortunately, people rarely remember what we say in a sermon. I think they say the average person can remember most of the points from one sermon a year. The point is that this isn’t random information from scripture, this is spiritual formation language and is meant to be used, not stored. For too long we’ve seen, sometimes foolishly, I think, discipleship as the impartation or reception of information rather than what scripture and the great saints of our history have said it was: Imitation of someone’s life. 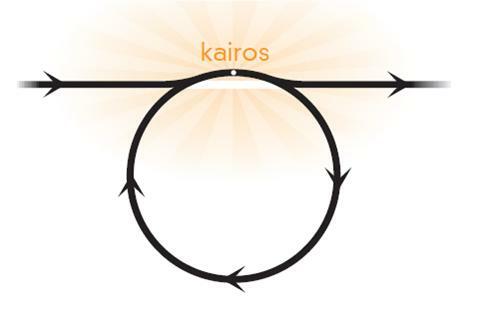 So principally, LifeShapes were made to fulfill the principle design of Jesus: Discipleship. Sharing the LifeShape @ the BACK end of the teaching…Yes!